Almost a year after the fact, I learned about the death, on 23 February 2010, of a good friend. I have never met Bill Pearce personally, but he helped me to get through some very difficult times in my life. I’ve lost touch with is work lately and at some other times, but it was there when I needed it most. 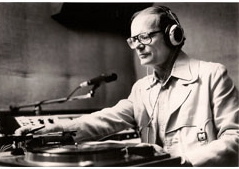 Bill Pearce may not have been very well known as a celebrity, but he touched the lives of many thousands of people around the world through his music and his nightly radio program, Nightsounds. It was his Nightsounds ministry that played an important part in my life. Now that Bill is no longer with us, I want to remember him for what he’s done for me. I first heard Bill Pearce on the radio as a disillusioned and lonely teenager back in the early 1970’s. I grew up watching the Vietnam War on television news and thought that, with my luck, I would probably get drafted, be sent over to fight and not come back. I wasn’t full of much hope for my future. I used to go out alone late at night for walks, taking a portable radio with me. There were some undeveloped hills in my neighborhood where I could go and sit and watch the stars in the sky and the lights in my neighborhood below and think about what meaning there might be for my life. Flipping my radio dial at 10:30 PM on a summer evening, I heard Bill Pearce’s voice talking about his faith in Jesus Christ and what it meant to him. Up until that point religion had little significance for me. I was raised in the Roman Catholic tradition and believed in God, but I didn’t have much confidence that God had any interest in me or my welfare. I always thought of God as someone who made all the rules and punished you when you broke them. I had never heard anyone talk about God and Jesus the way Bill Pearce did. He seemed to have an intimate, loving relationship with God. He was very humble, vulnerable and honest about himself, not like many of the radio and TV preachers I’ve heard or seen since. He played very soft and soothing, choral and instrumental sacred music (he was himself an accomplished singer and trombone player) of the kind that a 17-year-old rock and roll fan wouldn’t be caught dead listening to. But I got to like it and appreciate its message. More than that, I just liked to hear Bill Pearce talk. Each program opened with theme music from Claude Debussy’s “Beau Soir” (“Beautiful Evening”). Bill’s commentary and musical selections were usually along a particular theme, applying Scripture and wise words to the problems, joys and difficulties of life. I quickly got in the habit of listening to Nightsounds almost every evening and even recorded some of the programs. Bill used to offer to send books, free for the asking, to his listeners to help them with their spiritual growth. He never asked for money on the air but invited his listeners to write and join their mailing list if they wanted to support the ministry. When I left home for college, I continued listening almost nightly to the program on a local radio station. It provided some much needed continuity in my life and helped me to grow as a Christian, developing regular habits of Scripture study, prayer and regular church attendance. When I graduated from college, got married, got a regular job that paid well and offered a promising career as a computer software developer, and started raising a family the habit of staying up late at night to listen to a radio program gradually subsided. Over the next fifteen years I all but forgot about Nightsounds. I continued to grow as a Christian in other, more intellectual ways, mainly in response to challenges to my faith from people I would encounter on an early version of the Internet. My Christianity became less personal and heartfelt and more intellectualized and individualized. I grew very proficient in my professional life. My work assignments grew more challenging, interesting and meaningful to me as the years went on. After fifteen years with the company, I had finished one of the most creative and significant pieces of work in my whole career. I had worked with, and learned a great deal from, other very talented engineers, some of whom became good friends of mine. Then came one of the most disturbing experiences I had ever faced. The company I had worked for during the previous sixteen years was breaking itself up and laying off thousands of people in the process. This created quite a bit of chaos, especially for the my project. Some of the best managers left the company followed by some of my closest friends. I grew very scared and depressed. I decided to transfer to another project that I thought would broaden my professional skills. It was a somewhat frantic move to try to get away from a very unpleasant circumstance. It turned out not to be a very wise move. I soon discovered that the new project wasn’t at all what I thought it would be and felt that I had made a huge mistake. Transfers within the company were technically frozen while the breakup of the company was in progress and I found myself in a part of the company that would soon be in a separate company from that of my old project. Then the new project was cancelled! I was an inexperienced newcomer in a part of the company that would be much smaller than the one I had left. Prospects for a new assignment looked very bleak. I felt trapped and deeply depressed. The spiritual resources I had to deal with this situation had grown very weak over the years. I did not feel that I had a close enough relationship with God to believe or trust that he could, or would, help me. I turned back to the ways that had gotten me through difficult times in the past; mainly the Bible and prayer. I rediscovered those spiritual disciplines and practiced them at least three times a day, often staying up late into the night to pray. One night, I remembered Nightsounds and wondered if it was still on the air after fifteen years. I called the local Christian radio station and found out that it was still playing at 10:30 PM on weeknights. That night, sitting in my back room listening to the “Beau Soir” theme music and hearing Bill Pearce’s voice, I felt like I was being transported back to another time and place in my life. A numinous feeling of awe came over me as Bill introduced the program’s topic for the evening: “Downsizing”. It had been a long time since I had felt God’s presence in a room with me so heavily as I did that night listening to Bill talk about exactly the sort of fears and feelings that I was experiencing. Needless to say, I became a regular listener to Nightsounds again in the years following. It helped me through the worst of those depressing times and the difficult process of leaving my employer of nearly 21 years and going to work for another company. Eventually the radio station changed its format and no longer aired the Nightsounds program. I lost track of Bill Pearce and Nightsounds in the process of establishing myself in a new place of employment and attending seminary part time. I’m very happy that it was there to help me during some very difficult times in my life. I know that God has used this ministry to help many others over the years. Nightsounds recordings still air on many radio stations and are available from the ministry’s web site: http://www.nightsoundsradio.org. I hope it will continue to bless many more people in the future. There’s nothing else quite like it. This entry was posted in People, Personal. Bookmark the permalink.